Max Scherzer was a pitch from perfect Saturday afternoon, six days after he’d also brushed against perfection. He was ferocious again. He was willful. He threw a no-hitter, then threw his arms in the air and caught one Washington Nationals teammate after another in post-game embraces. So this was his work week: 18 innings, 57 batters faced, 54 retired, three baserunners, one (broken-bat) hit, 26 strikeouts. "I’m just locked," Scherzer told reporters. On a day against the Pittsburgh Pirates at Nationals Park when the crowd rose to greet most of his last few dozen pitches, Scherzer threw the 289th no-hitter in MLB history. That it was not a perfect game came to a single pitch – a 2-and-2 slider – with two out in the ninth inning to pinch-hitter Jose Tabata. The slider was inside, Tabata crouched into it and was hit on the front elbow. Tabata appeared to glance back at plate umpire Mike Muchlinski, as he’d made little effort to avoid the pitch, and might even have invited the pitch to hit him. Muchlinski motioned him to first base. "Just didn’t finish the pitch," Scherzer said. "Backed up on me. And clipped him." The next hitter – Josh Harrison – flied to left field for the 27th out. 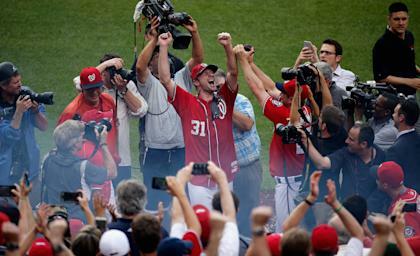 "I realized I lost a perfect game," Scherzer said. "You just move on. Finish the thing out." Asked his opinion of the plate appearance that stood between Scherzer and the 24th perfect game – 22nd in the modern era – Nationals manager Matt Williams deflected the question. "I think that’s irrelevant at this point," he said. "The last thing I’m going to do is walk on the field and mess up Maxy’s rhythm. That’d be a crying shame. I ain’t doing that." Scherzer threw 106 pitches, struck out 10 Pirates, and appeared to gain strength – if a drove of 97-mph fastballs were an indication – in the final few innings. By the seventh inning, Scherzer was feeling the moment. He’d been revived by a long bottom of the sixth, when the Nationals scored four runs in their 6-0 win. In that time, he’d returned to the air-conditioned clubhouse, changed into a dry jersey, and knew he had the stuff to run through the last out. By then, Scherzer was huffing after each pitch, snapping at the return throws from catcher Wilson Ramos, eager to ride that earnest fastball, along with a slider that at times looked like a strike and then was not and at other times did not look like a strike and then was. "I knew," Scherzer said, "I could come with everything I got for those last few innings." For all the winning they’ve done lately – eight games in a row and 21 of 26 until Friday night in D.C. – the Pirates generally have done it with their pitching staff, not with an offense that’s about average and has strikeout tendencies. The lineup was particularly vulnerable against Scherzer, though perhaps not because of its own frailties. Scherzer, whose January signing – for seven years and $210 million – seemed to be a luxury addition for the heavily-favored Nationals, was that good against the Milwaukee Brewers last Sunday, and was the same pitcher Saturday. He’d entered his 14th start as a National third in the National League in ERA, second in strikeouts, first in WHIP and WAR and strikeouts per walk, and second in batting average against – to Francisco Liriano, who opposed him Saturday. And he was that same pitcher Saturday. And more. "My last two starts," Scherzer said, "this is some of the best baseball I’ve thrown, the best pitching I’ve done." In the post-game celebration, Scherzer was doused with chocolate syrup, a thing the Nationals do in victory. Teammates glub-glubbed the syrup on his head, his face, his shoulders, until he looked like a giant chocolate Easter bunny. Scherzer laughed and shrieked his approval. "Six bottles?" he laughed afterward. "Good god."